Rakhine State will target investments in tourism, fisheries and agriculture at an investment fair that will be held in February in Ngapali, southern Rakhine, Rakhine State Chief Minister U Nyi Pu told the media in Yangon yesterday. Illegal sugar trading continues at the border area of Myawady in Kayin State despite the government suspension of sugar import and re-export, an official of a local sugar trade group said. There have been repercussions from the decline in rice exports at the Muse gate, illegal trade, and the recent withdrawal of the EU’s Generalized Scheme of Preferences on Myanmar’s export sector. As a result, we see some difficulties in the short term. UN Secretary-General Antonio Guterres on Friday criticised as “too slow” Myanmar’s efforts to allow the return of Rohingya Muslim refugees, describing the lack of progress as a source of “enormous frustration”. A plan to launch a derivatives market in Myanmar is afoot, but an important step is to put in place an appropriate regulatory regime. Ascent Capital Partners Pte. Ltd., a Singapore-registered fund management firm, has announced the launch of a Myanmar-focused private equity fund – Ascent Myanmar Growth Fund I LP (“AMGF”). 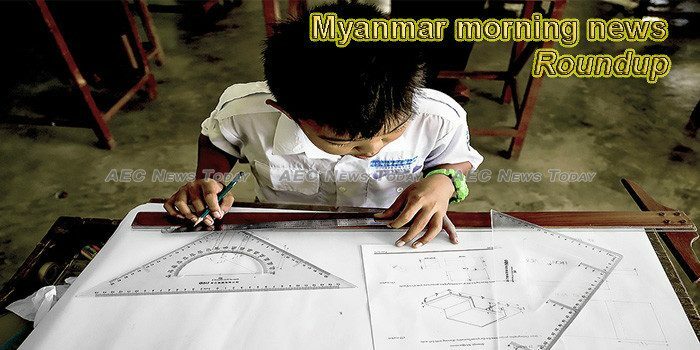 Myanmar Government officials and businesses have requested the European Union (EU) to reconsider the potential move to withdraw its generalised scheme of preferences (GSP) benefit from the country fearing negative impacts on growth and population. Both feel the move will result in high levels of unemployment resulting from migration of foreign business houses. Some 31 Rohingya refugees have been living in inhuman conditions between the Bangladesh and India border for the last three days, according to local media reports on Monday. Three Kachin State ministers have reportedly been asked to put forward resignation letters under a directive of the State Counsellor. An investment festival to attract investors for the development of Rakhine State will be held at Ngapali beach. The Home Ministry declared that Myanmar authorities have captured a huge quantity of narcotic drugs in Moemeik of Kachin state and Ma Bein in Shan state. An 11-member Border Guard Bangladesh (BGB) delegation has reached Maungdaw in Myanmar for a flag meeting on various border-related issues between the two countries. Kenya won almost all places in Myanmar’s 7th Yoma Yangon International Marathon 2019, held at the Thuwuna National Indoor Stadium on Sunday, Myanmar News Agency reported Monday. Myanmar’s economic adviser under the military regime and former Brigadier General of Tatmadaw (military), David Abel, passed away at the age of 84 yesterday. Hindu Rohingya refugees in Bangladesh say they are desperate to go home. They had fled to Bangladesh fearing reprisals after they refused to join an armed Rohingya group. Peace Win Japan under the Japan Nippon Foundation will give agricultural training to armed ethnic groups in Kawkareik and Myawady in Kayin State to help then earn more from farming, said U Win Hlaing Oo, head of the Agriculture Department.